A few days ago Safeway had a big sale on blueberries – which I love, so I bought the huge pack. 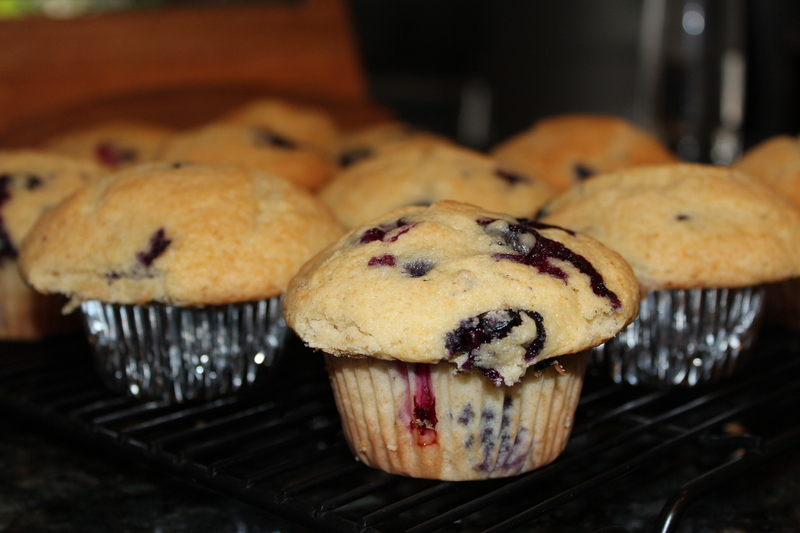 I decided to give homemade blueberry muffins a try this morning – they were delicious! I stole the recipe from Martha Stewart (click here to go to the site). Preheat the oven to 375 degrees. Butter large (3 3/4 inches) or small (2 3/4 inches) muffin tins, and set aside. In a large bowl, sift together flour, baking powder, and salt; set aside. In the bowl of an electric mixer fitted with the paddle attachment, cream butter and sugar on medium speed until fluffy, about 3 minutes. Add egg, egg yolks, and vanilla; mix until well combined. Reduce speed to low; alternate adding reserved flour mixture and milk to mixer, beginning and ending with flour. Remove bowl from mixer; gently fold in berries by hand. Divide batter among muffin tins; sprinkle generously with sugar. Bake until light golden, about 45 minutes for large muffins, about 30 minutes for small muffins. Cool in pan 15 minutes. Remove from pan; transfer to wire rack, and let cool completely.